According to a recent Skyscanner report, London tops Singaporeans’ searches for European cities when it comes to holiday planning. This is not surprising given that the Mastercard’s Global Destination Index also lists London as the second most visited city in the world after Bangkok. Ask any Singaporean who loves London to reel off his usual hangouts, and he’s most likely to mention places in Central London like Borough market or Harrods and Covent Garden in West London, home to foodie havens of fresh produce and cooked food and high-end shopping and artisanal crafts. The east end of London is less visited, though it offers no less attractions, especially in Shoreditch where unbridled creativity with a heavy dose of cool and originality can be found in cutting-edge bars, ethnic restaurants and avant garde art galleries. The Curtain is both a hip hotel and a private members’ club. The latter ratchets up the exclusivity factor a few notches. Inside the brick building is a playground for London’s cool cats. A plush decor and low lighting give off naughty but fun vibes. 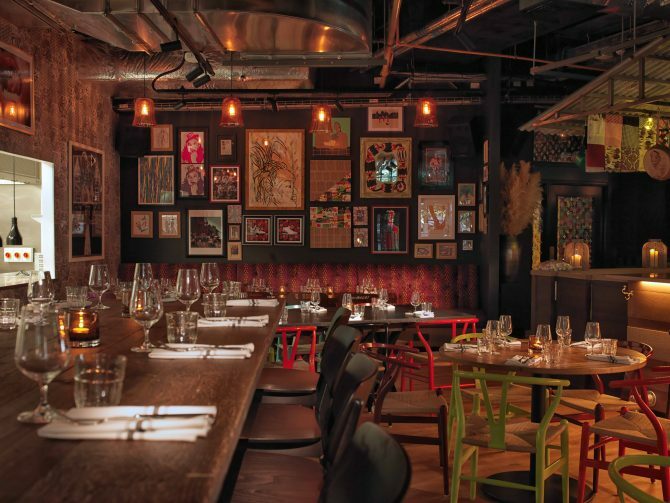 The design theme is edgy East London style with exposed brick walls and a moody colour. The F & B offerings here are an attraction on their own. Red Rooster in the basement of the hotel draws scores on its Harlem soul food such as southern fried chicken and waffles. The décor here is Harlem hip-hop, naturally.